You'll remember that my Valentine was some 2500 miles away on the shores of Waikiki on the 14th. He lovingly sent text photo after text photo of swaying palms, sunlit beaches, his beer at lunch, as well as a few surfers catching the waves with Diamond Head as a magnificent backddrop. Little did I know, he had also done a bit of shopping. The following afternoon after watching him gracefully land his enormous 767 at Lindbergh Field (San Diego) he popped into the car and we raced up the highway to hopefully make our 6PM date with my Dad for our monthly Wine Club pickup. As the traffic slowed somewhere near Sea World, he glanced my direction and said, "Grab my backpack". Well, it was all the way in the back and I looked at him and thought, "Really? You want me to climb all the way into the back for your backpack?" But I dutifully crawled over the seats and brought the pack up front. Thinking he was rummaging through the pack for some work related item, I was surprised when produced a small, colorful bag with a little gold box inside. He smiled and said, "I picked this up for you!" and slid it my direction. 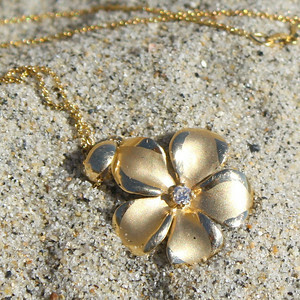 A little giddy, I opened the box to find a lovely, gold rendition of my favorite tropical flower, the Plumeria, hanging from a delicate gold chain. Knowing my love for the tropics he couldn't have chosen anything better! With my heart melting, I quickly removed the pendant and necklace from the box and had it around my neck in seconds. He smiled and said, "I knew it would look perfect!" Making our date with Dad, we enjoyed our special monthly evening chatting while tasting our wine selections, then selected our favorites. Arriving home I had a surprise for the third special man in my life, my 14 year old son. He has been begging for Peanut Butter Rice Krispie Treats for weeks, but alas, the last time we went to make them the peanut butter was gone. Hence, we created the Nutella Rice Krispie Treats, which he truly enjoyed, but his heart was set on Peanut Butter. Perfect for baking, if you can stop yourself from eating them out of hand! With the ingredients finally in the pantry, a box of Trader Joe's Mini Milk Chocolate Peanut Butter Cups considerably boosted the peanut "butteriness" of these sumptuous treats. Topped with a chocolate/peanut butter ganache-like frosting these krispies are anything but ordinary. Enticing peanut butter aromas from the melty cups and the ganache permeated the kitchen requiring us to set the ganache in the freezer so we could indulge faster. Peanut buttery, chocolaty, krispy and beyond delicious, these treats won't last long on your counter! Prepare a 9 x 13 pan with cooking spray. In a large bowl mix the cereal and mini peanut butter cups, set aside. Melt the marshmallows and butter together in a medium saucepan over medium heat. Pour the melted marshmallow mixture over the cereal mixture, quickly stirring well to evenly coat the cereal. Pour the cereal mixture into the prepared pan and evenly press into the pan. In a small sauce pan melt the peanut butter and chocolate over low heat, stirring to combine. Pour the melted chocolate over the cereal mixture, spreading with a rubber spatula to cover. Allow the topping to set, then cut and serve! Note: We were too impatient to allow ours to set, so we placed it into the refrigerator for about 1/2 hour to speed up the process!! Gorgeous pendant! And the treats ain't bad either, Kim! 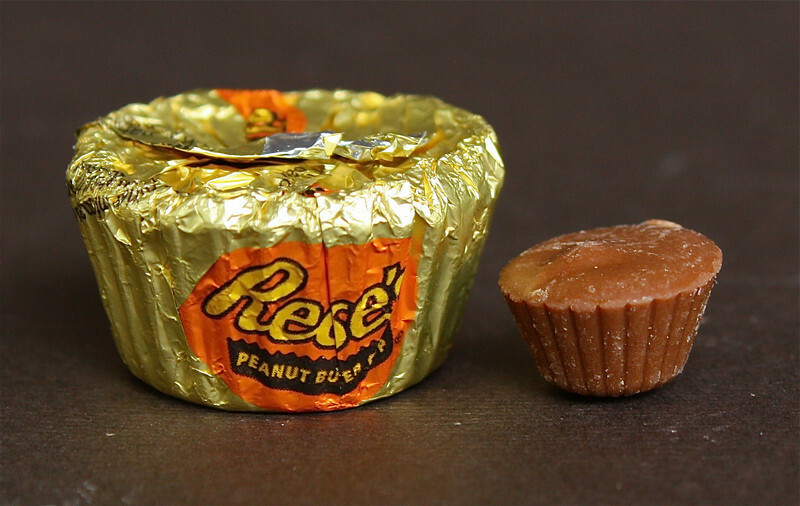 We don't have TJs in Texas, but Reese's makes mini PB cups now too. I think I need some of these...to me? PB and choc is a combo that's meant to be incorporated whenever possible!! I absolutely love the pendant! Oh, and the treats! Those wouldn't survive the cutting in my house... We'd eat them straight from the pan! Great post, great recipe! I agree that these would not last VERY long! What a wonderful gift that "Mr.Romantic" brought you. Enjoy the long holiday weekend!! These Rice Krispy treats are over the full moon. Who can resist chocolate, peanut butter and marshmallows, with the Rice Krispys. We love TJ's don't we. I've been there twice in 2 days. Beautiful necklace! I have to try this recipe-- I love anything chocolate and peanut butter. Yummy! Those looks great. Hmmm peanut butter. These look awesome! I'd totally rock out with my inner kid and one of these! 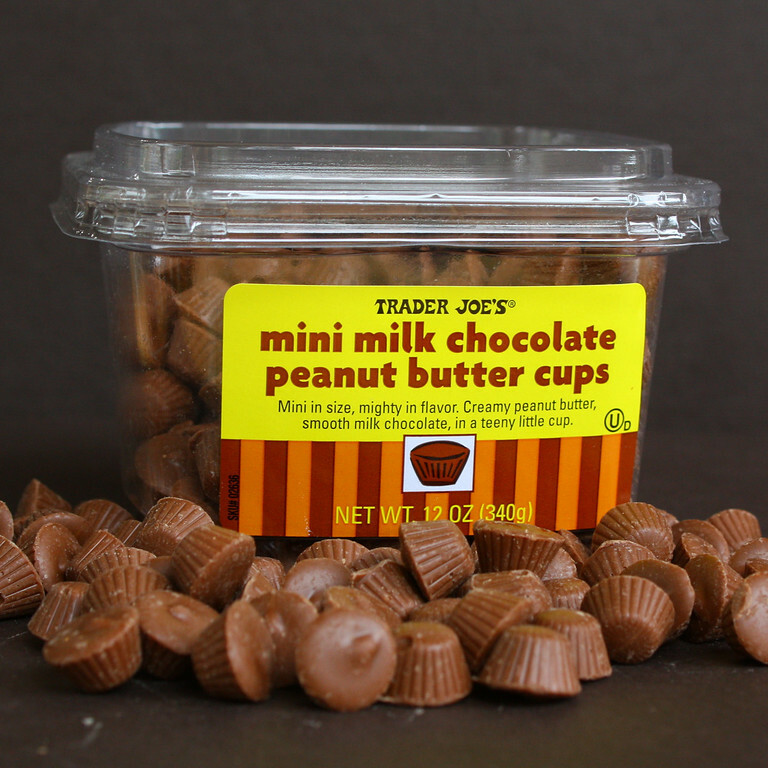 I'm in love with those Trader Joe's Mini Peanut butter cups, I can't stop eating them! I seriously need to make these bars. Next time I'll try this version. Have a great weekend! I am addicted to the mini PB cups! Your photos are enticing too! Peanut butter is pure bliss. There is no other way to say that. Your treats look delicious and I'm so excited for your present! That is beautiful! How sweet! Aww! Your husband is so sweet and that necklace is gorgeous! 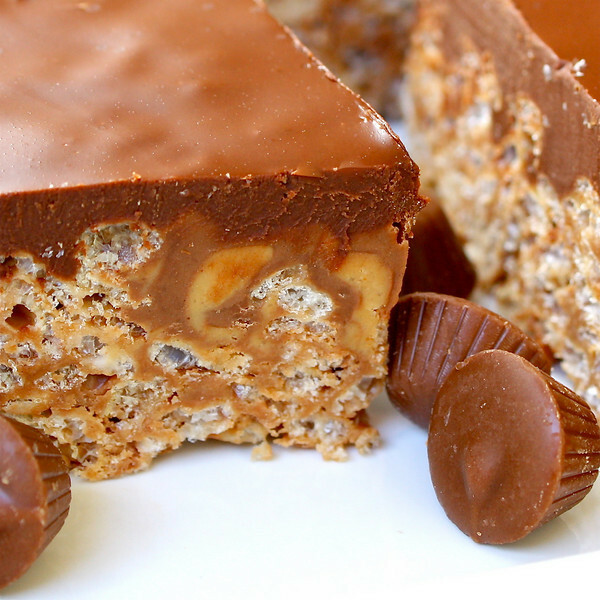 These PB Rice Krispie Treats look awesome, as well! I love peanut butter rice kripies treats. My Mom always made them when we were kids and they are still my favorite. This takes them to a whole nother level - love it! PB in rice kripies... I've been hooked for a long time, but I've never had them with Reese's and they have never looked as perfect as yours! Oh my, your husband is such a sweetie! Nice work, can he give mine a few tips? Actually, I did well this V-day, I shouldn't complain. Now pass me the plate of these awesome treats, stat! I think those rice krispie treats are a wow!!! 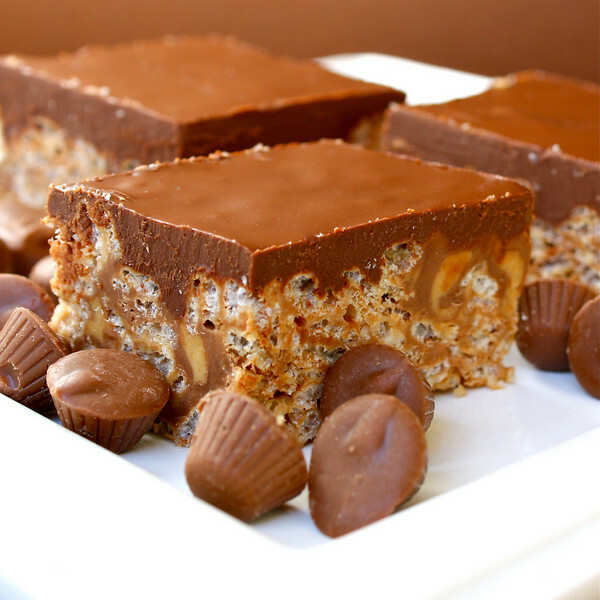 I have to say adding in those peanut butter cups is such genius! 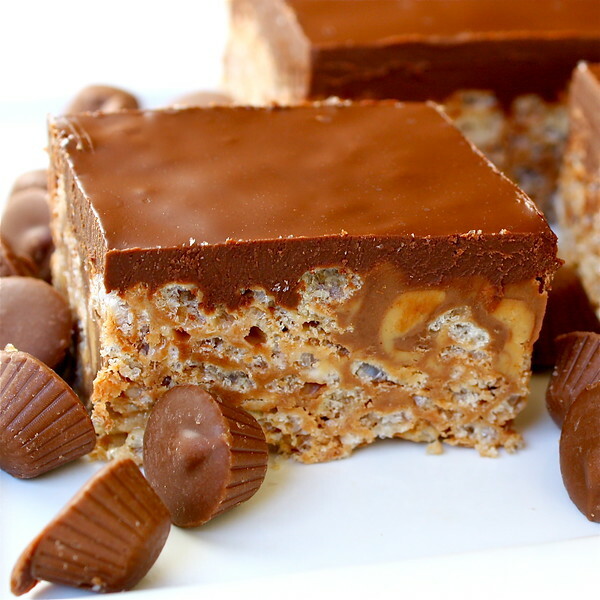 Great looking bars, but anything with PB & chocolate is delicious in my book! Love those mini joes. I think reeses just came out with something similar, must be trying to compete! Ho...ly...cow. I am at a loss for words. Those look incredible! I'm with Lauren - these would go straight from bowl to mouth. Cute story - your Valentine really is a sweetie! I just made a peanut butter rice krispies treat too ! i guess great minds think alike eh! How sweet and what a lovely gift! We used to make rice crispy treats all the time with the kids. Brings back wonderful memories! Peanut butter rice krispies treats sound wonderful. So delicious. okay, i did not know trader joes even MADE those! awesome awesome awesome! I LOVE those treats as well! Chocolate and peanut butter is my weakness! Have a lovely day! LOOOVE the photos as well!!! You have some great recipes on your blog!! Is there any way you can add a link to a printer friendly version of your recipe? It might be there but I didn't see it. An Award Winning Super Bowl!